The emergency services have failed to recover a car after it was submerged in the sea in Ceredigion. Borth Coastguard Rescue Team was called to Ynyslas beach at about 11:30 BST on Monday. They were joined by Dyfed-Powys Police and Natural Resources Wales officers, but attempts to tow the vehicle out of the sand were unsuccessful. 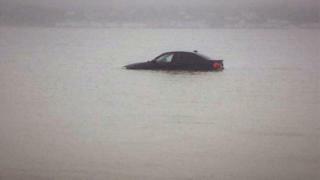 A Borth CRT spokesman said two high tides had covered the vehicle and it was "firmly stuck". "The owners will have to now arrange for it to be recovered by other means," he said, adding situations like this can be avoided by checking tide times.